Got enough time to take a few snaps of the 6120 classic. Nice phone really small and slim. The August event of Mobile Monday Mumbai is on the topic “Location Based Services” and will be held on 27th August. Thanks to Qualcomm for sponsoring the event and supporting the community. What are the trends in Location Based Services globally? This is one good news I read on AAS , India overtakes USA as Nokia's second largest market. It happens only in India, literally. After going through most of the news and blogs on the net I found that India is one country that has reacted the most to the issue. I blame it to news channels for this, the way they went on about it the whole day when Nokia made the battery announcement. And there was no need to show that exploding cell phone visual. The choice between longer battery life or more up-to-date presence (a much requested feature). Reading and writing comments from and to your contacts. Go back in time! Using the ’stream view’ for your contacts, you can see what they were doing and saying in the past, not just their most recent post. More than just Jaikus! You can also see when your contacts have posted to flickr. Improved presence view, to make the most of your screen real-estate. A whole raft of usability improvements, based on what our users have been telling us they need, including an even easier to use interface, and a progress meter, so you can see what’s happening. More optimal data transfer and connection maintenance, giving you more bang for your wireless data dollar. …and all the essential (but not that interesting) stuff like bug fixes, speed improvements, that sort of thing. Oh, and let’s not forget - a spiffy new manual for this client. BTW, do read Stefan Constantinescu's "My afternoon at Nokia Headquarters in Espoo, Finland" and get jealous. "Sideloading involves users downloading mobile content (ringtones, wallpapers, music, games) onto the PC and transferring it to the mobile. Since the content does not pass through the mobile operator’s network, it cannot be charged for and there is a revenue loss to the operator." Mobile Pundit has put together how sideloading is a pain to the operators and what the Indian biggies have said about here. Nokia says sideloading is a key feature for iPhone & smartphones , read here. YOUR NOKIA PHONE WON'T EXPLODE. I am ,like most Indians, a big Nokia fan. This post is just to tell all that there is no problem with the Nokia phones, its only a defective battery. I was really annoyed with a news channel showing a graphic of Nokia 6600 bursting into flames. These kind of visuals do have an effect on a lot of people. Just checked out this post on Tech2.com. Please read it and spread the word. Visit the official Nokia battery replacement announcement on my post here. "Tired of the standard ring tones available on your phone? Got a creative streak? 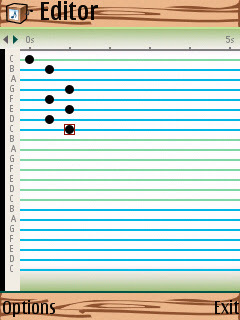 This month’s exclusive download is Music Box, a simple, fun way to create your own ring tones." So log on to S60.com and get it. This Nokia battery replacement announcement has spread like wild fire. I first read it on AAS , then got it from friends on IM , got Jaiku'ed about it and got a couple of mails from friends. If you've got a nokia phone in the period Dec 2005 and Nov 2006 do check out this link. You may get your battery replaced. Indian residents can find out their battery info by sending sms, see the image below, its form the Nokia India site. The 26 character battery id no. can be found on the back of the battery. This is what I always wanted. Play radio on phone by plugging any headset/headphone and NO ANTENNA. I connected my computer speakers directly to the N95 headset jack to listen to some MP3's on the card. I just turned Visual Radio on and to my surprise the FM worked loud and clear. This is something I have never come across earlier. Does N95 have an in-built FM receiver/antenna? I thought its necessary to plug the headset(AD-43) first which came with the N95. "Anything you connect will act as an antenna." Well I didn't know that and I am sure many others also were not aware of it. Its going to be a month now with the N95 and its been quiet an experience. I got the phone with firmware v11 and at that time v12 was already out. But the net was full of posts talking about v12 bugs. So after 7 days of holding myself back I gave up and upgraded to v12. I was quiet happy with v11, there were no issues but then every one had upgraded (every one with N95 puts down their firmware version in their signature on most of the forums) so I couldn't have stayed with it. Yes the keypress bug is present but its not as annoying as many have said, even I am a fast texter and hardly encounter the bug. But the thing is that it (the bug) shouldn't be there and so I hope that its rectified in V12+. Another thing that I would like in the upcoming firmware is the Active Standby Plugins feature. I've already posted about my slider issues , and I think I will be heading to the service center to find out if they can fix that gap on the right bottom side of the slider. I don't want that fragile N95 feeling whenever I press any right side key on the slider. One more thing that needs to be fixed in the newer firmware is the radio volume when the speakers are on. My dad's Sony Ericsson J230 has much better loudspeaker output than the N95. I cant stand all those comments my dad passes when I use his phone to listen to the radio :( . I never use the Multimedia keys. I hope they make it configurable or at least make it do something else like opening the most frequently programs or whatever. The camera is one of the most impressive features the N95 has. I've taken say 300+ photos with it so far, with the maximum of them of my month old niece. I find the sports mode and the close up mode very useful at times. I've tried the Edit picture option and its quiet impressive too. I just don't understand the cartoonize feature in the in the Apply Effects options. I thought it was related to some cartoon stuff but it does some image color transformations. The camera captured the 3 blades of the fan in sports mode. So far the phone has hung just once. I was downloading a pic, it was just 54 kb. Just as the transfer reached 99% the phone restarted. Now that was bad. But as soon as the phone started I got a query box asking "There are incomplete downloads. Would you like to see them?" something like that, so it opened the browser. I went into options - downloads and saw the transfer was paused at 99%, all I had to do was resume the transfer. Now thats good :D .
So overall the N95 is a wonderful device you wont part away once you have it, with a little issues that I hope will get better with the firmware upgrades. 1 - Nokia 6110 Navigator to be won. The 6110 Navigator support page is up on Nokia-India site. So expect it soon in stores. Its main feature: its a Navigator. Actually it comes with an internal GPS receiver and Map's application. So does the N95, but the maps software used in 6110 is not Nokia's own Maps software but its Route 66, which is a third party application. Which means that the phone will come with quiet a comprehensive map of India. Actually India is not a Map country. We usually do not carry around maps like they do in the west, even when we are driving long distances. So having commercials out with people getting happy using the maps feature wont entice any one buying the 6110. They will really have to price it right as there are a lot of phones with the same specifications (except GPS). OS wars : Should Symbian worry about Windows Mobile? Every two weeks or so there has to be an article regarding Symbian vs Windows Mobile/iPhone/Linux/..
"Symbian people don't like to hear this, but outside their world, it's very common to hear statements like 'I don't really like Windows Mobile, but I'm familiar with the interface and it synchs with all my desktop apps.' "
" There are more Symbian phones sold than iPods, so Symbian has no fear from the the iPhone, either. " Lots of people seem not so happy with the E90 according to this link. 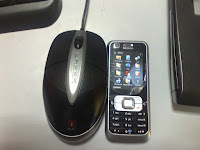 Some say the price is not justified, some think whats the difference in features between a communicator and any other NSeries phone while some miss the S80 interface. I think its one of the coolest device available with a different form factor, forget the E & N Series funda because even I dont understand Nokia's categorization , but yes its a little expensive. Don't think they left behind anything that was there in 9500/9300, in fact I found the S60 interface much faster than the earlier S80. Its loaded with features and is indeed an eye candy. No matter what others have to say its 10/10 from me to E90. Definitely not a "New Coke moment". 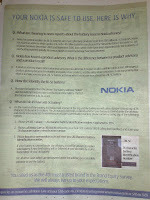 I see this ad a lot nowadays on TV, its called 'I am Nokia NSeries'. So just browsing and came across the same promotion on the Nokia APAC site. 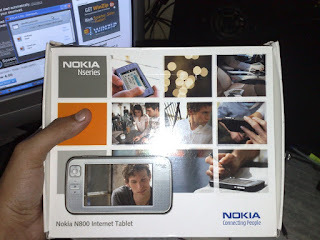 Nothing much just the same nseries flash site with 'I am Nokia NSeries' images added. Also a friendster link where you can comment which NSeries you are. I never keep the 'WLAN scanning' option ON and I don't want the 'WLAN scanning off' displayed on my standby screen, that goes also for 'No calendar entries today'. If there are no entries don't show it. But there is no setting that would allow me to get them off the active standby. 'Active standby plugin' is one of the cool features that they have not included in the N95 and other phones. Its there in E65,E50 and may be some other phones as well. It's just a customization so why not include it in all phones. It would be great if this comes up in next firmware upgrade for other phones.